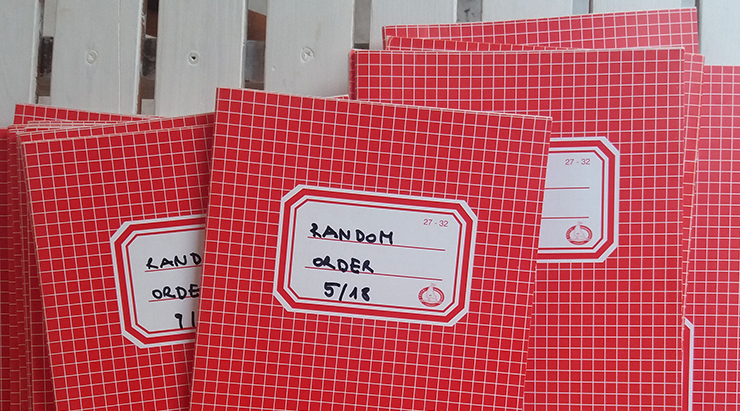 THE BASIS OF THIS ARTISTS’ BOOK PROJECT ARE THESE 18 NOTEBOOKS AND A FEW ONLINE RANDOM GENERATORS. + This notebook contains 64 pages or 32 sheets; therefore the objective was to create 32 series of 18 drawings (one for each book) using a drawing algorithm or rule inspired by a random task proposed by the online idea generator at random-idea.com. + Considering that each sheet is actually a 40 rows and 28 columns table, the (final) drawing image needs to somehow make use of it or fit within this base. + Btw. my 32 so called drawing dates were also determined by a random generator at random.org. + On the assigned date I visited the www.random-idea.com web page, and pressed the ‘New Idea’ button to receive a new specific assignment to be accomplished. + Once I had my thing to do, my task was to transform it into a drawing algorithm or rule to create black and white visual images; using the base (40 x 28) table. + However, as much as I tried to consider and execute any of the given suggestions, I did allow myself two so-called jokers per day (or sheet). Meaning if I feel that the given idea cannot be transformed into a drawing algorithm; I could press the button again, and again. But I could not go backwards. With other words, I was allowed to skip the first two ideas given, but needed to stick with the third one no matter what.